I have to start this post by declaring my love for Rick Riordan’s books. As far as I’m concerned, The Lightning Thief is still the absolute standout of post-Harry Potter children’s fantasy, and the entire Percy Jackson series is exceptional (and so are the audio books). I also loved his contribution to the 39 Clues franchise, Maze of Bones, which I plan on reading to my 4th graders this year (what better way to tie in lessons about all the reference resources in the library?). 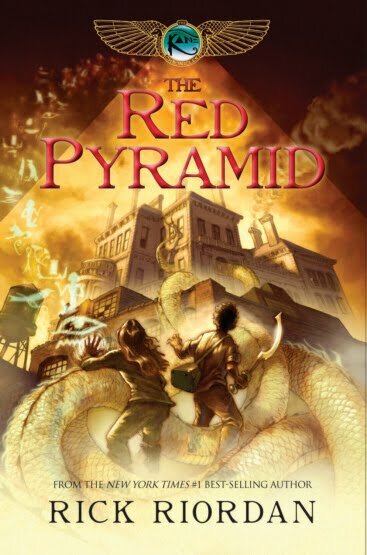 So I was really excited about the first installment of his new Egyptian gods series The Kane Chronicles, The Red Pyramid. I even had great mythology displays planned around his books. But I was really disappointed with this one. The premise of the series is promising. Brother and sister Carter and Sadie Kane have grown up separately since the death of their mother. 14-year-old Carter travels the world with their father, a famous Egyptologist. 12-year-old Sadie lives in London with her maternal grandparents. But during their family Christmas holiday together in London, strange events unfold and their father disappears. It’s up to Carter and Sadie to unlock centuries-old family secrets, find their father, and understand new powers they’ve discovered within themselves. And the answers all lie hidden in Egyptian mythology. Now, at this point if you know anything about Percy Jackson you can guess where this is going, but I won’t spoil it for you if you don’t. I actually think this all sounds pretty fantastic. My issue with this book is the pacing. It felt extremely slow, and switching narration between Sadie and Carter every chapter or so felt forced. The cast of mythological characters is even bigger here than in The Lightning Thief, and keeping track of all that plus the different personalities and narration styles of the 2 main characters became confusing and a little tedious. And it required so much explanation that the book dried out for me. Hard as I tried to stay involved, I frequently lost interest in the story when there was just too much going on. The magic of the Percy Jackson series is Percy; his voice, his narration, his wit all the way through with a great cast of supporting characters. Two narrators was tough here. I was in the bookstore yesterday next to a young boy (3rd or 4th grade) and his mom who were looking at Rick Riordan’s books. His mom was actually trying to get him to try The Red Pyramid, but he told her, “I did already, and it was so boring. It wasn’t fast and cool like Percy Jackson.” I think that sums up my thoughts exactly. I am hoping that with future installments this series will hit its stride, because I do think it’s a great continuation of Rick Riordan’s flair for mythology. I love the idea, it just needs to get its sea legs.